classed as members of the thrush family Turdidae, but now[vague] considered Old World flycatchers. of the subfamily Saxicolinae. There are a large number of genera. Most northern species are strong migrants. 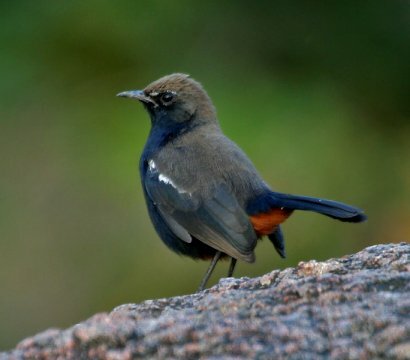 The appearance of these birds is very varied, but they mostly have weak songs and harsh calls. They are small to medium birds, ranging from 10 to 21 centimetres in length. Many species are a dull brown in colour, but the plumage of some can be much brighter, especially in the males. Most have broad flattened bills suited to catching insects in flight, although the few ground foraging species typically have finer bills. Australian chats, genera Ashbyia and Epthianura of the honeyeater family (Meliphagidae). They belong to a more ancient lineage than Saxicolinae. family, Parulidae; its true relationships are unresolved.